Great Smoky Mountains National Park seems endless with its vistas of rolling mountains like waves running into the distance – but hidden in the middle of it all is a beautiful flat valley of almost 7,000 acres, a haven for wildlife of all kinds, and human visitors. This is Cades Cove, the most popular destination in the park, with 2.5 million visitors each year. With its morning fogs and typical Smokies sunsets and sunrises, its signature flatness in the midst of the mountains, and a peaceful serenity in the air that grips the visitor, Cades Cove has an unmistakable and distinct look, recognizable in the countless photographs of the area taken by its millions of devoted fans. 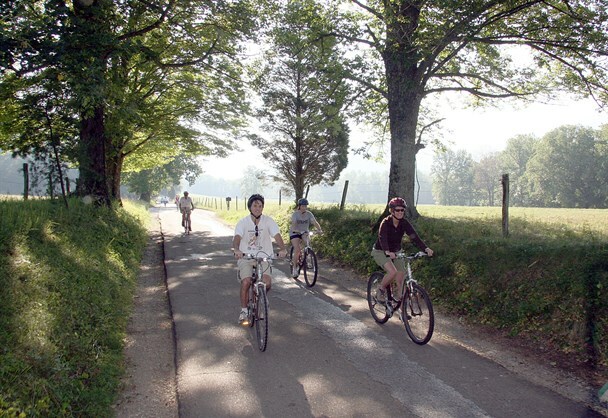 A loop road offers a driving experience through Cades Cove, with many places to stop, and many activities to enjoy – it’s a perfect place for a picnic. The sights of history and wildlife can fill your whole day, from touring the churches, cemeteries and cabins of old, to spotting bear cubs at play in the distance. Several hiking trailheads begin at Cades Cove, and there’s camping for all tastes, from simple tents to motor homes. The roads are the only relatively flat ones you’ll find in the park, perfect for bicycles – and there’s a store where you can rent them. There’s also a horse stables offering guided tours on horseback, as well as hayrides for the whole family. One of the park’s four Visitor Centers is stationed in the Cove, open all year except Christmas Day. As well as real rangers to offer help and advice, the visitor center has public restrooms and a bookstore and shop with maps, guides and materials of interest. Close by are a working grist mill and several other historic structures. 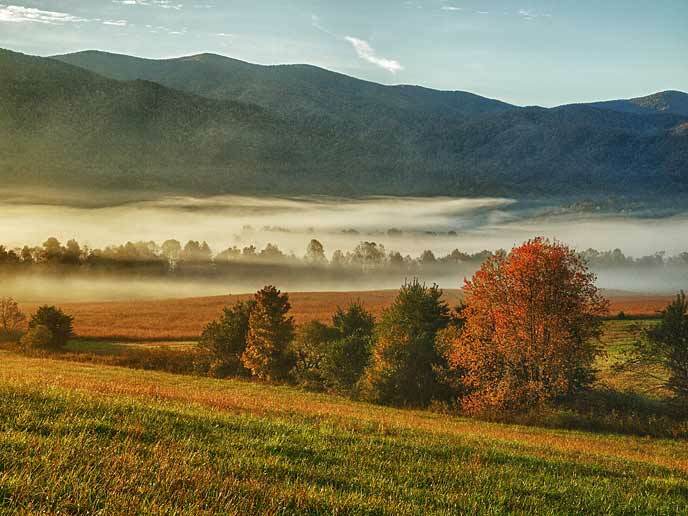 Since 1820, Appalachian settlers lived and worked in Cades Cove, and the Cherokee hunted here for hundreds of years before, until the park service took over the area’s preservation as a designated “historical area”. With its many historic buildings, tools and artifacts, Cades Cove is today acclaimed as one of the best places in the nation to absorb the experience of how people lived traditionally in the midst of the still flourishing beauty of their natural surroundings. Cades Cove is also one of the best places in Great Smoky Mountains National Park to see wildlife – which is saying a lot given the park’s status as a unique habitat that teems with life. White-tailed deer are everywhere, and turkeys are a frequent sight. Black bears and their cubs are also seen, often crossing the road or climbing the trees. Sometimes elk can be seen here too, as well as many other smaller animals. For the correct way to behave around these wild animals, be sure to see our guide to Bears and Wildlife in the Park. One of the park’s 10 developed campgrounds is at Cades Coves, with 159 sites ranging from tent to motor home. Facilities are limited, so be sure to see the Cades Cove Campground page offered by the Park Service for full details. There’s a store at the location for basic necessities, as well as concessions that rent bicycles, offer sandwiches and – most importantly – sell ice cream. Sitting on the log licking an ice cream cone is one of the prime memories for many people of good times at Cades Cove. Note that your cell phone will NOT work at this site! Even your satellite will be obstructed by the trees overhead. For fuel and the benefits of town, Townsend is only 9 miles away. Google the site beforehand at Latitude/Longitude: 35.6025, -83.77667. But remember, don’t rely on your GPS anywhere in the Smoky Mountains. All during the peak season, from early May through late September, the 11-mile loop road is reserved for bikers and walkers on Wednesday and Saturday of each week until 10 am – no cars. Check the website for Cades Cove Bike Rental. On the shoulder seasons, outside of Memorial and Labor Days, the rental bicycles are offered at a discount. As with many things in the area, off-peak at the beginning and end of the season is a prime time for smart visitors to avoid the crowds and save money. Cabin rentals are the same way – check our Specials page to see what discounts are offered. 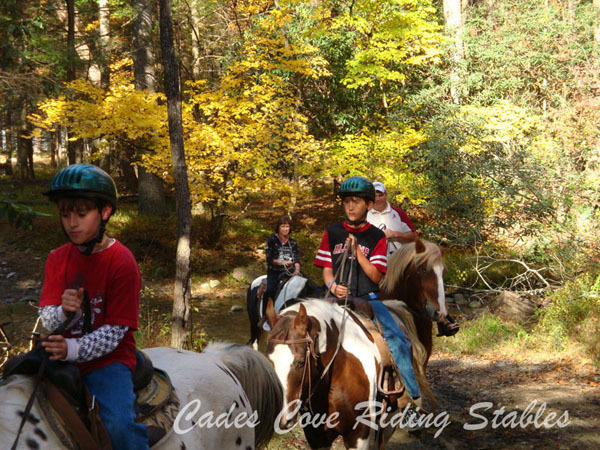 Cades Cove Riding Stables is an authorized concession operating in the Cove between early March and late November. If you love to ride, or want to get started, take a guided horseback ride through the local sights. As every horse rider knows, the view is best from up on a horse! As an alternative, the stables offers carriage rides and group hayrides, suitable for all ages. The guides offer their knowledge of the area, and point out things you might not have seen on your own – certainly not from a car. Some of the hayrides are led by park Rangers, and constitute a valuable home-schooling experience for kids and adults alike – and it’s a lot of fun too. For experienced riders, there is also Anthony Creek Horse Camp, one of the horse camps operated by the park. Located close to the Cades Cove Campground, the horse camp offers primitive camping with horse stalls and a pets-on-leash policy. Nearby riding trails offer fairly strenuous treks with outstanding views. See the camp’s information page at recreation.gov: Anthony Creek Horse Camp. It’s easy to spend the whole day at Cades Cove, especially with several day-hikes that begin in the Cove. Try a hike to the Elijah Oliver Cabin, half a mile each way. And there’s the Cades Cove Nature Trail, just half a mile long, beautiful, absorbing and kid-friendly. The trailhead to Abrams Falls, a very popular hike, begins in the Cove. It’s 2.5 miles long, making a 5-mile round trip. For a longer hike, take the 4.5 mile trail to Gregory Bald (9 miles round trip). The Rocky Top trail originates in Cades Cove also, as well as Thunderhead Mountain – both longer hikes. For a low price, the park has a full-color topographical map and guide to the 9 Best Day Hikes in and around Cades Cove. Elevation charts give a quick view of how hard each trek will be – and when hiking in the mountains, it’s important to know before you go! The guide includes Abrams Falls, Gregory Bald, Rich Mountain Loop and Spence Field. If you prefer not to drive yourself, consider Heritage Tours, a private non-profit service dedicated to imparting the best experience of Cades Cove, and alleviating traffic. Supported by community partners, the Great Smoky Mountains Heritage Center, Smoky Mountains Convention & Visitors Bureau, and the National Parks Conservation Association, the service offers tours by 19-passenger bus for individuals and groups. Based in Townsend, the service is perfect for church groups, wedding parties, families and couples – in fact, anybody who wants to sit back and let someone else unfold the living story of Cades Cove. Having someone else drive allows you time to take photographs and soak in the sights. Great Smoky Mountains National Park never closes, although roads can often be closed from weather and other causes (check the park’s Twitter feed for latest updates). The Cades Cove Visitor Center is open all year except Christmas Day, from 9 am until 4:30 pm. and later during summer months. It’s located at the midpoint of the loop, at the western end. Note that the grist mill shuts down during winter. In general, March through November is open season for most of the attractions that are not winter-tolerant. The time of highest traffic is between Memorial Day and Labor Day. The Cades Cove Loop is a one-way, 11-mile loop road with the campground and picnic facilities at the starting end, to the east, and the Visitor Center at the mid-point of the horseshoe loop, at the western end. There are 2 lanes that cut north-south across the loop, Sparks Lane and Hyatt lane. Traffic on the loop road can be very slow – the lanes can be shortcuts, but of course you also miss many of the sights. Drivers are asked to pull over to stop to look at something, but not all do, some stop and hold up all traffic behind them. Wildlife crossing the road has the same effect. Delays are inevitable. However, there’s much to see, literally wherever you pause – the best advice is to be patient and courteous and enjoy every chance to look around. Early morning or late evening in daylight are the best times to beat the crowds. For a minimal cost, the park’s Self-Guide Auto Tour booklet is worth picking up at the start of the loop, or online. To get to the area from Gatlinburg, enter Great Smoky Mountains National Park and at Sugarlands Visitor Center take Little River Road. This is a winding road and beautifully scenic in its own right. During fall the colors are exceptional. This goes for approximately 25 miles, and becomes Laurel Creek Road, which ends at Cades Cove. From Pigeon Forge, the Wears Valley road, Hwy 321, is a peaceful and beautiful drive to Townsend, where you turn south to Laurel Creek Road, and on to Cades Cove. There are 2 other roads into Cades Cove, both closed in winter, but Laurel Creek is the entrance to the Loop.